Hello girls! My April Julep Maven has arrived in Canada!! Winnipeg to be exact. I found that my orders from Julep come *really* quick. 10 days on average, which is fabulous. They are in Seattle! This is a bit more of a pricey subscription and it took me awhile to try it. But, with the first box being a penny, I couldn't resist..now I just really enjoy the colours and quality. I was buying an Essie every week anyways! I'm a "Classic with a Twist." If you're not happy with what you are getting you can switch to another grouping such as It Girl, American Beauty, Boho etc. The nice thing about this beauty box is you see what you are getting every month. With nail polish and a club that's a bit more pricey, it's a really good thing. The first colour (above) is Mandy. It's described as a fresh, bright, deep coral-pink. A favorite for summer pedicures, but surprisingly fetching on manicures, too. Now, the picture shows up like a hot pink, orangey, bright red here. But it's really not. I find it more in the pink family. Like a pinky colour. I swatched it and I love it! It's a cream and you can get away with just one coat. The colour makes me think of watermelon. The second colour I received is Susie. It's described as a delicious mint green creme. I'm a little on the fence on this colour. It's definitely spring, but it may look a bit better if my skin were a bit darker. It does need at least two coats and maybe if you have ridges (and mine are minor) you may need to use a ridge filler or a good base coat first. If I could describe the colour it makes me think of those light green 1950's appliance. Which is a great colour, really! I think I'll try it on my toes and maybe once I get a bit of colour try it again on my hands. Also, my 3rd product was "The Best Pedi Creme Ever!" I've heard *really* good reviews on this, so I can't wait to try it... I'll be trying it asap! Just yesterday I spent an hour working on my pedicure getting my feet summer ready. I find my heels get dryer in summer more than winter, since I'm always wearing flip flops. This tube retails for $22 on their website. Just a side note, if you're an "It Girl" you get 3 polishes instead of the extra product. I actually really enjoy getting the other product! They have some GOOD stuff! 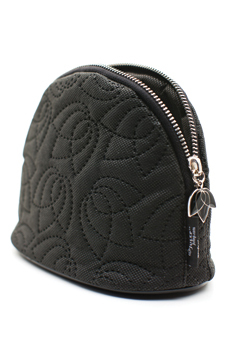 There are 3 compartments inside that fit the Julep polishes perfectly and a slightly larger pocket that fits the pedi creme, almost perfectly..and lots of room for extra stuff. This would be great for travel where you pack a few polishes with you! It was a nice little bonus! It retails currently for 14.99 on their website. Oh, I almost forgot! They also included foam toe seperators. My husband said, "Are those foam knuckles or something?" Heheh! As well, since it was Easter there were 5 chocolate eggs in there. :) Notice..I said "were" haa! 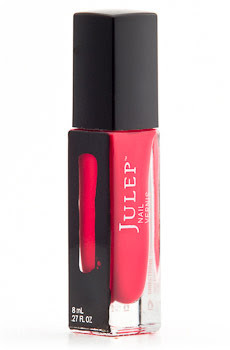 Are you signed up for Julep Maven? Have a great night! no no don't live by that rule ! We sure don't ! My St.patricks day box was big compared to my previous valentines day mystery box ! They seem to just keep getting bigger for me ! Oh, that's weird!! I didn't find the makeup bag really spectacular though. I'm just using it to store my Julep polishes in it for nw. Which style do you get and did you order any add ons? I'm still waiting for my add ons, wish I chose niecy now. :/ I chose the gray one (I believe Annette) and the bluey one..Parker? Yes, niecy was one of the It Girl colours! I kept debating between Niecy and Annette and now I'm kicking myself. I'll get it some time though, because I can't stop drooling over it!